One of the best parts of my job are the occasional house calls to check out books. Today I'm off to Gilbertsville, NY to go through 20-30,000 books that belonged to a former schoolteacher. It's one of my favorite local villages, and the sun is out (for now) so it should be a good day. 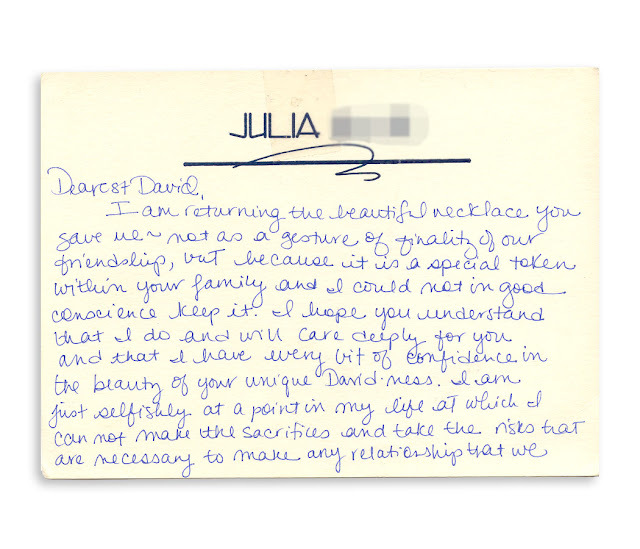 Dearest David, I am returning the beautiful necklace you gave me - not as a gesture if finality of our friendship, but because it is a special token in your family and I could not in good conscience keep it. 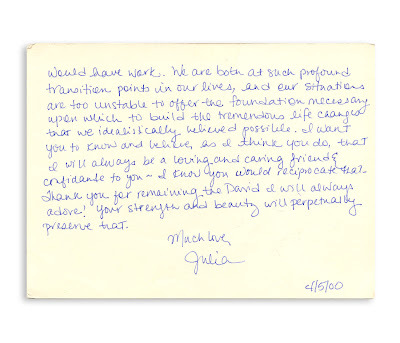 I hope you understand that I do and will care deeply for you and that I have every bit of confidence in the beauty of your unique David-ness. I am just selfishly at a point in my life at which I can not make the sacrifices and take the risks that are necessary to make any relationship that we would have work. 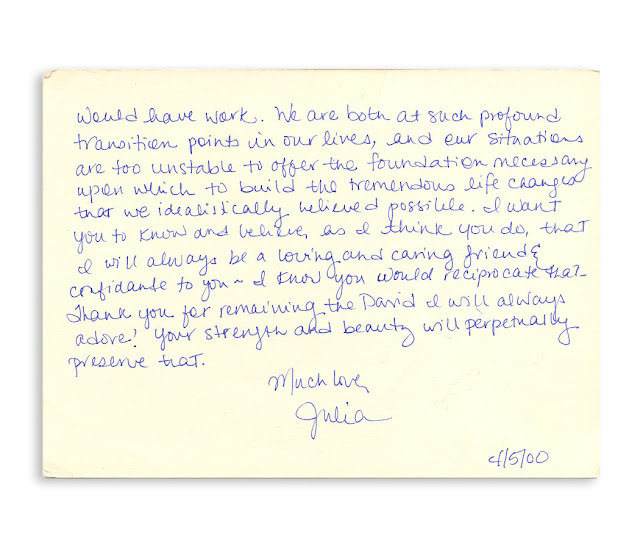 We are both at such profound transition points in our lives, and our situations are too unstable to offer the foundation necessary upon which to build the tremendous life changes that we idealistically believed possible. I want to know and believe, as I think you do, that I will always be a loving and caring friend & confidante to you - I know you would reciprocate that. Thank you for remaining the David I will always adore! Your strength and beauty will perpetually preserve that. Found in "The Remains of the Day" by Kazuo Ishiguro. Published by Vintage, 1990. Awww...this is a sweet one. I feel so curious about who these people are - what happened to them and where they are now. I hope all is happy in their lives! 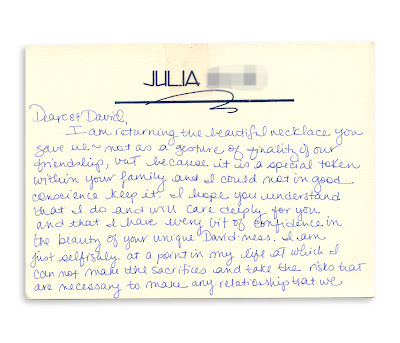 Best written 'Dear John' letter ever. The day in Gilbertson sounds excellent. And why was David so cavalier about filing that swell letter? I love the letters you find. I think they could provide some inspiration to writers. 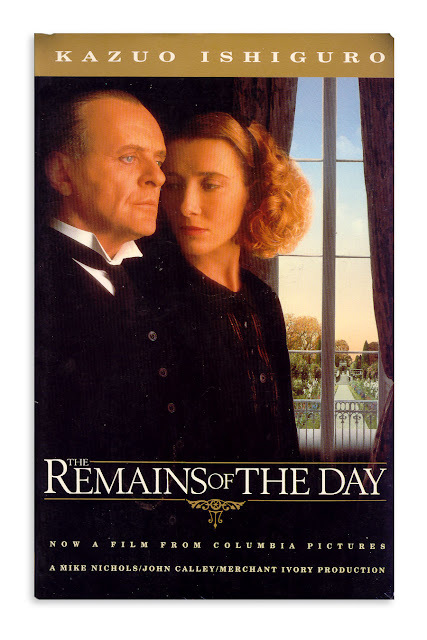 How symbolically poignant that the letter should be in Remains of the Day.